Many women are either confused about what to look for infertility vitamins or they don’t see the need to take vitamins at all. Let me take some time to explain why vitamin supplements are necessary in order to increase your fertility as well as whyprenatal vitamins are necessary prior to and during pregnancy for you and your unborn child. Most women don’t get the vitamins and minerals needed from the food they eat from day to day. We would have to eat a whole lot of fruits, vegetables, meats, and grains in order to get the balance of vitamins and minerals that our bodies need to thrive and be our healthiest. Women’s vitamins are especially important when a woman is trying to conceiveand during pregnancy. These are specifically called prenatal vitamins. Prenatal vitamins supply a rich assortment of vitamins and minerals to help a woman conceive and bring forth a healthy baby. These vitamins and minerals are necessary to help keep our hormones balanced and our nervous system running smoothly as well as keeping all our organs functioning optimally. Let me stress – We all need to take a multivitamin and multi mineral supplement to make up for what is lacking in the food we eat. Even the bestdiet in the world will not give you all the nutrients you need for your best chance at getting pregnant and bringing forth an optimally healthy child. So what do you look for? 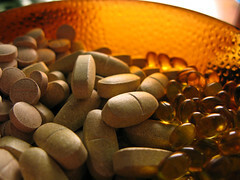 What are the qualities of the best fertility vitamins and prenatal vitamin supplements? Well, I’m no expert. But I can tell you what I took that helped me to be more fertile and energetic and have a trouble-free pregnancy. I looked into several prenatal vitaminsbefore choosing what I believe to be the best multi vitamin supplement that’s all natural and made from organically-grown plant compounds (see below). The other prenatal vitamins were synthetically made with artificial coloring. I also ate lots of fruits and vegetables and drank a lot of purified water. (See my Preconception page for more on this.) Make sure your multivitamin has at least 400 mcg of folic acid (I took 800 mcg daily) in order to prevent neural tube defects in your unborn baby. This neural tube develops within the first month of life, so it’s important to get enough folic acid before you get pregnant.